Let's talk about Thanksgiving for a minute, OK? I think a lot of us make this holiday way more complicated than it needs to be. We spend days (or even weeks!) seeking out new recipes, creating elaborate menus, and figuring out fancy techniques to bust out on the big day. And the weird part is that, often, the thing people love most about Thanksgiving are the old favorites! All that work, and your brother just wants the same old stuffing. Bummer, right? Over the next few weeks, I'll be sharing some of my solid favorite Thanksgiving recipes, but showing you a few creative ways to mix them up and serve them. So your family gets to enjoy their favorites, and you still get to play around in the kitchen. 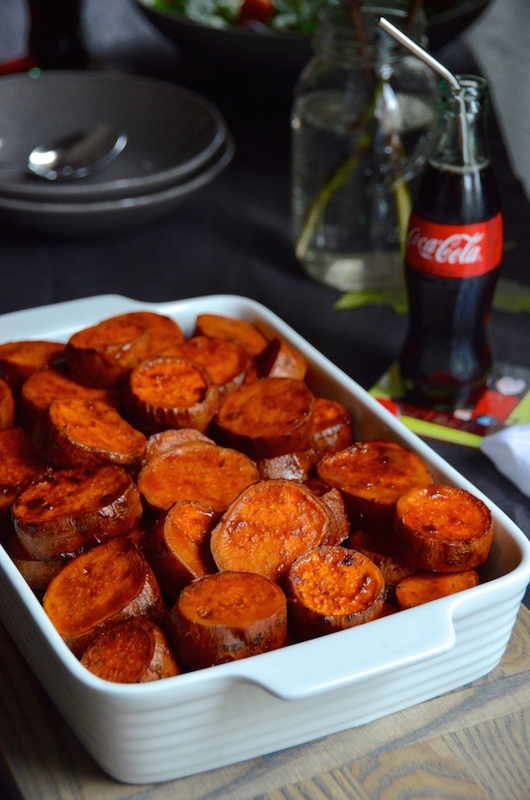 First up are these Chipotle Coca-Cola Sweet Potatoes. 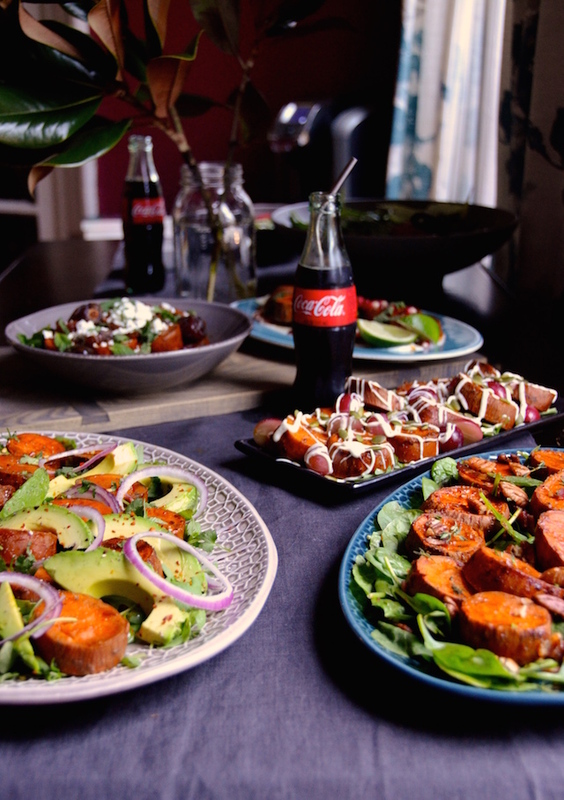 This season, I've partnered with Coca-Cola to share some favorite holiday recipes and party inspiration so this felt like the perfect recipe to start off this series. 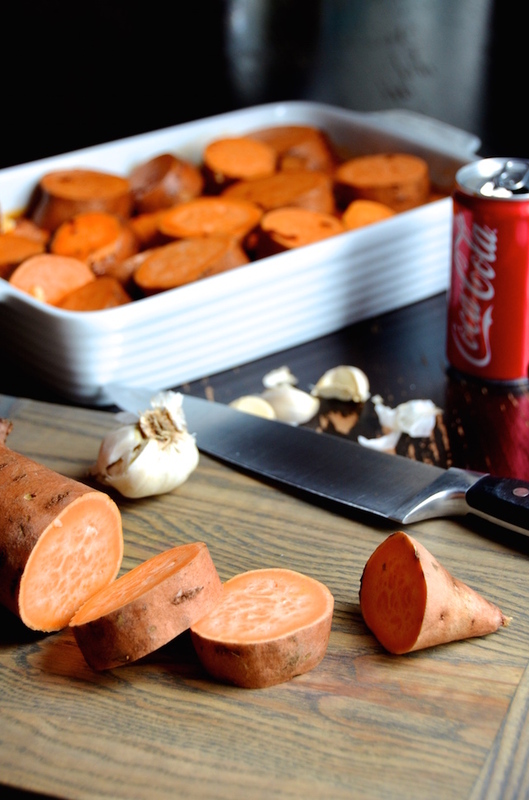 I've been making this easy sweet potato recipe for about 7 years, and it has never let me down. And the best part? SO easy. You puree a few ingredients, pour them over the sweet potatoes, and bake. I'm NOT even going to make you peel the potatoes! Awesome, right? And I promised you fun, right? 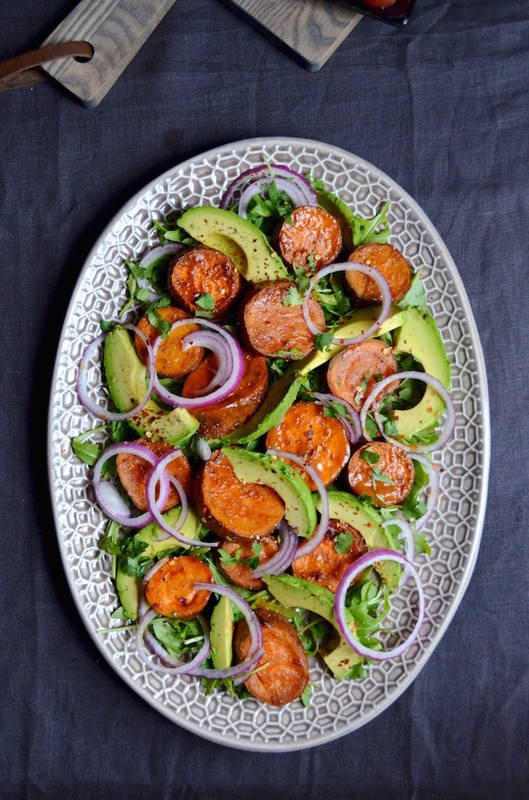 Because while these sweet potatoes are amazing served as-is (seriously...I'm talking spicy, smokey, and a little bit sweet...so perfect! ), they're also a great base for some super creative (and easy!) serving ideas. I love this because it gives you a chance to personalize and customize your dish, while still keeping everyone happy. I confess that this one is my favorite because of the avocados. Hello...yum! 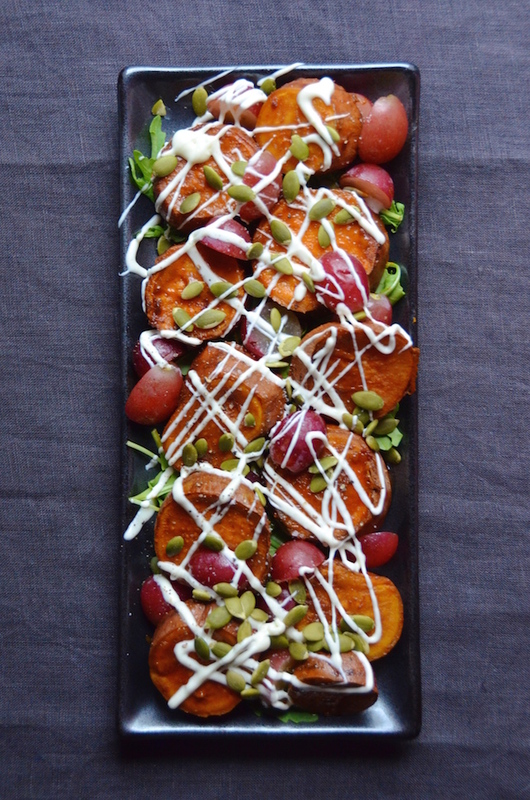 To make, you just layer the cooked sweet potatoes (recipe at the end of the post!) over a bed of arugula with avocado wedges and thinly sliced red onions. Garnish with fresh cilantro and red chile flakes, drizzle with a bit of olive oil and fresh lime juice just before serving. This one can be served warm or at room temperature. You may have to double the recipe because it goes FAST! If you're a fan of Middle Eastern flavors, this one is for you! Add some sweet and savory Mediterranean influence by tossing your cooked sweet potatoes with chopped sweet dates, fresh mint, and crumbled goat or feta cheese. Just a few ingredients, but the results are incredible. You knew one of these ideas would have to include bacon, right? I love this twist on a classic spinach & bacon salad. 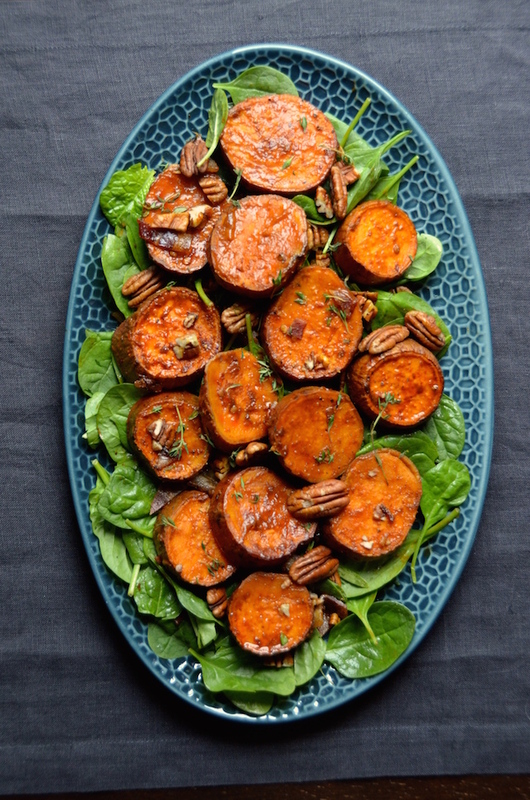 Toss baby spinach with the cooked sweet potatoes and garnish generously with crisped and chopped bacon, fresh thyme, and toasted chopped pecans. Drizzle with olive oil and a bit of red wine vinegar, just before serving. So perfect. If you've never tried grapes in savory dishes, I'm going to need you to start now. They add a juicy burst of flavor and are wonderful combined with the spicy roasted sweet potatoes. Garnish with some yogurt, black pepper, and toasted pumpkin seeds over a bed of mixed greens. So simple, but so impressive, you fancy chef, you! I lied. This one is my real favorite. Pomegranates are one of the prettiest things about fall, and they definitely belong on your Thanksgiving table. 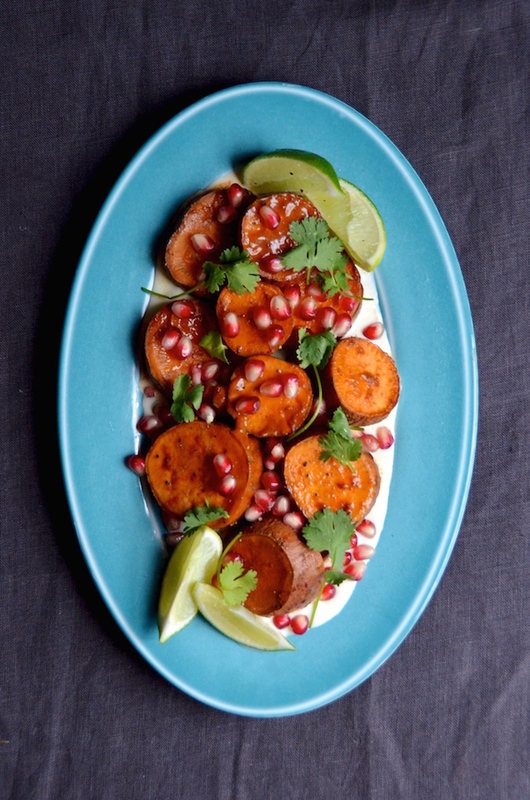 Spread sour cream or creme fraiche in an even layer on your serving plate, then top with the cooked sweet potatoes, pomegranate seeds, black pepper, and fresh cilantro. Drizzle the whole thing with fresh lime juice (and include a few extra wedges for serving!). The sweet, spicy, and tart combination is out of this world! And there you have it! 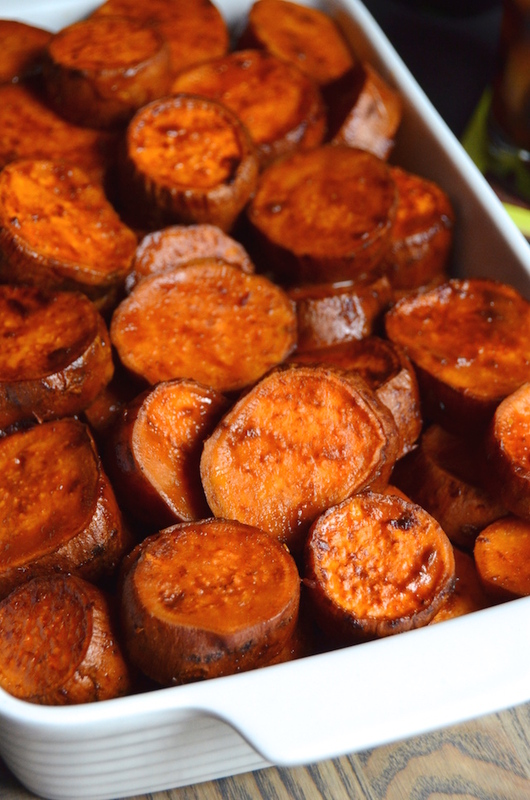 One super easy sweet potato recipe, and a bunch of fun new ways to serve it. I hope this post inspired you to have fun with some of your classic recipes this Thanksgiving. 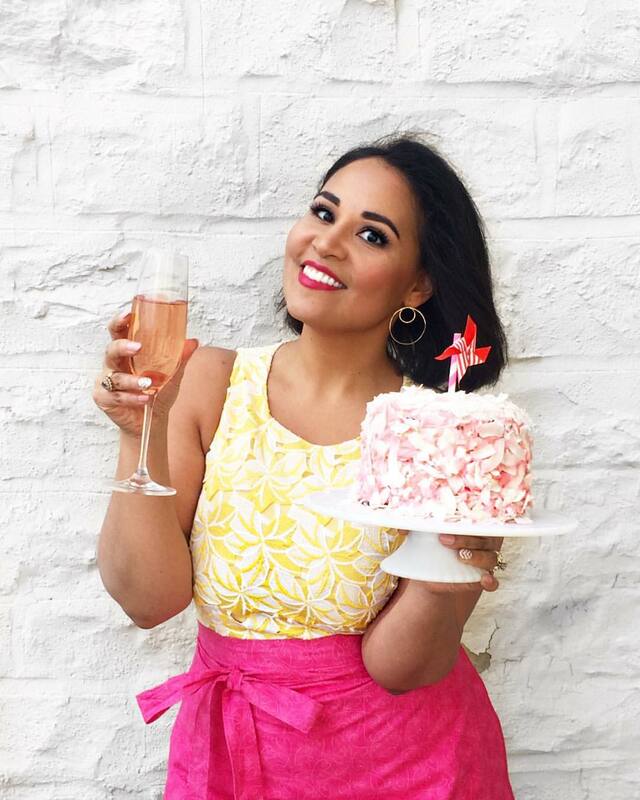 Stay tuned for more ideas from me, and hop on over to the Coca-Cola Pinterest Page for some more fun recipe and party inspiration. Disclosure: This post was sponsored by Coca-Cola. 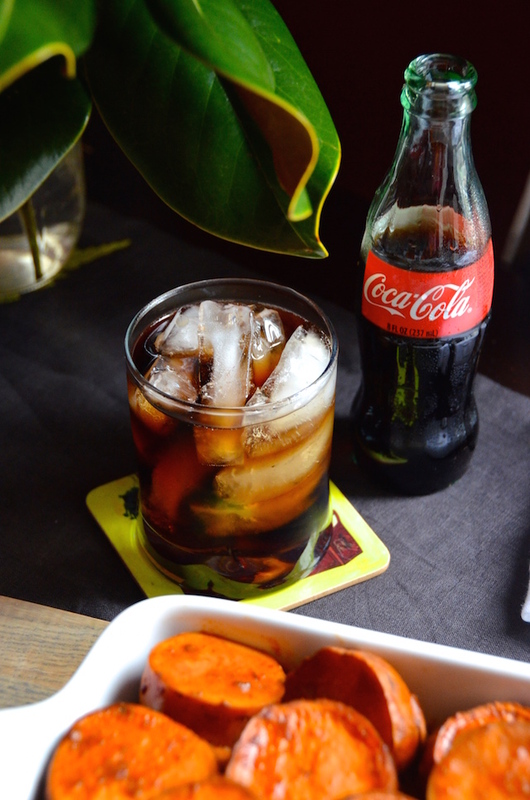 Over the next few months, I will be sharing a series of recipes and entertaining ideas featuring Coca-Cola. All recipes and opinions are strictly my own. You can also visit the Coca-Cola Pinterest Page for more entertaining tips, inspiration, and ideas. Thank you for supporting great brands that make it possible for me to create fresh new content for you! 4 tablespoons butter, cut into pieces. Scrub sweet potatoes and slice into 1-inch thick slices (no need to peel). Arrange in a baking dish or roasting pan with at least 2” sides. In a blender, combine Coca-cola, garlic, chipotle peppers, and adobo sauce. Puree until smooth for 1 minute, then pour over sweet potatoes. Season generously with kosher salt and black pepper. Top off with pats of butter, then cover with foil and bake for 25 minutes. Remove foil, then bake an additional 20 minutes, or until tender. Taste and adjust seasoning with additional salt and pepper, as desired. Serve as-is or with one of the suggested topping ideas described in the post above! These look amazing!! Do you ever just serve them by themselves without being on a salad? I want to make these for Thanksgiving as a side dish! Thanks for sharing!! Yes! You can definitely just serve on their own. I serve them that way, too and they are wonderful!